This desk medallion holder measures 4" x 1.5" and holds any medallion. It weighs 2 OZ. and is made of solid wood. 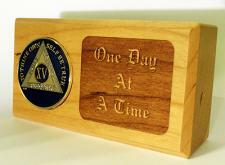 It has, One Day At A Time, carved on it's front.